The Illinois Lamb & Wool Producers have been serving the Illinois sheep industry for over 60 years. The Illinois Purebred Sheep breeders Association was started on May 28, 1944. The first meeting was held at the University of Illinois Stock Pavilion. The name of the association was changed in the 1960’s to Illinois Lamb and Wool Producers to reflect the broader membership and goals of the organization. Membership is open to anyone interested in the promotion and advancement of the Illinois Sheep Industry. Both Purebred and commercial producers are encouraged to join and participate. Dues are $20.00 on an annual basis. 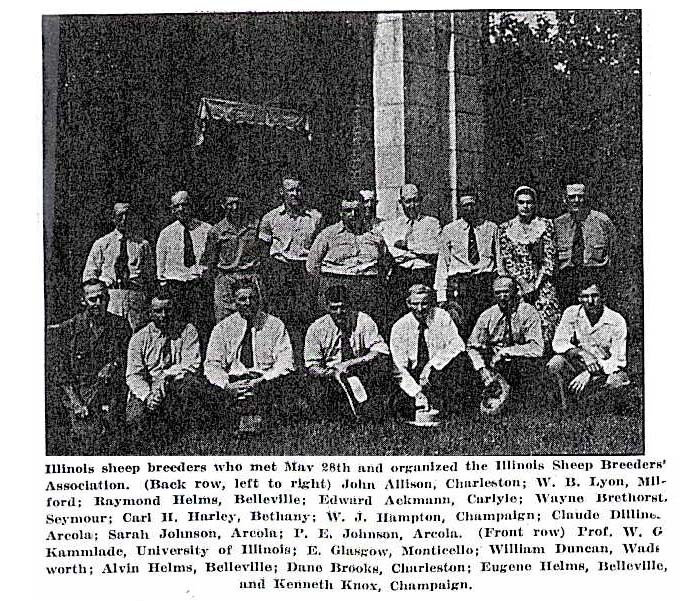 The Illinois Purebred Sheep Breeders’ Association was established May 28, 1944, at Urbana, IL., When a group of breeders met for the purpose of considering various matters affecting their interests. Membership in the Association is available to any Illinois breeder of purebred sheep upon payment of $2.00 annual dues. One of the early major efforts of the association will be a ram and ewe sale to be held at the University Stock Pavilion at Urbana in late August or early September. The arrangements for the management of the sale were placed in the hands of the association’s officers. Great stress was placed on the importance of each consignor bringing only the very best sheep to the sale. Several other activities were suggested and discussed. The following officers were elected: President, Everett E. Glasgow, Monticello; Vice President, Eugene Helms, Belleville; and Secretary-Treasurer, W. G. Kammlade, Urbana. Directors elected to represent various groups of breeders during the first year of the association are: John C. Allison, Charleston, to represent the Shropshire breeders; Raymond Helms, Belleville, Southdown breeders; Wm. B. Lyon, Milford Hampshire breeders; W.J. Hampton, Champaign, Oxford breeders; Alvin Helms, Belleville, Cheviot breeders; Val Crane, St. Charles, Dorset breeders; C. W. Dilliner, Arcola, Corriedale breeders; William Duncan, Wadsworth, director representing all other breeders.